Pucara Carita is the product of us attempting to bring Baron Lafite genetics into our herd for out crossing to the Kahuna and Huckleberry lines. And in this female cria there is living proof of how dynamic that union of elite genetics has performed. Pucara Carita was the result of a carefully planned breeding by us to Young Carmello who was one of Baron LaFite's top male offspring. The reason we are so high on him was bacuse he is the product of a Ramilo daughter and a Baron son. This adds so much potence to our already reliable genes in the line of Carita's mother, Pucara Rosarita who is a Cadette daughter. 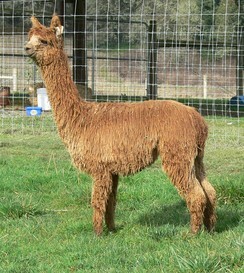 Cadete is the sire of so many championship and best in show alpacas we've lost count! Carita has been a great mom, good birther, produces plenty of milk and adores her cria! Just look at the depth of this young girl's parentage: Bruxo, Baron, Ramilo, Baron Lafite, Cadete, MacGyver, Carmello, and 2012 Colored Herdsire of the year, LCA Huckleberry de Latah. The infusion of this greatness has produced a dynamite fleece blessed with intense luster, cool handle and separation of lock that Suri breeders adore, all without an ounce of preparation. Carina proudly displays coverage to the ground on a stellar frame. She is a gal that can be taken out of the pasture and into the show ring, doing the owner proud.